Few wine lovers would disagree with Gerald Asher’s analysis of the pleasure that we derive from drinking wine; to truly relish and savour a good wine we need to be in the appropriate “key”. The right food, the right company (or absence of, perhaps! ), the right atmosphere, and so on. A memorable wine may well transform an otherwise unremarkable evening, but those wine moments that give us most pleasure and the most vivid memories occur when all these unpredictable elements combine in a unique scenario which could never be fully replicated. When this happens we enter “the right key” and we are moved to respond to a good wine in the way it truly deserves. We all have our most treasured wine moments. For me they include sipping a stunning glass of Brunello di Montalcino outside a tiny bar in the namesake town, nibbling on a plate of local Pecorino cheese and watching the sun set over the Tuscan countryside. Trying and failing to avoid spilling wine on myself as I sampled a juicy young wine straight from a special pouring jog at a lively harvest festival in Priorat. Devouring a hearty bottle of Malbec and an exquisite barbecued steak with good friends at an estancia in the remote Argentine pampa after a hard day of horse riding. Be warned, my fellow wine lovers – these are the kind of unforgettable wine experiences that seduce people into the wine industry. 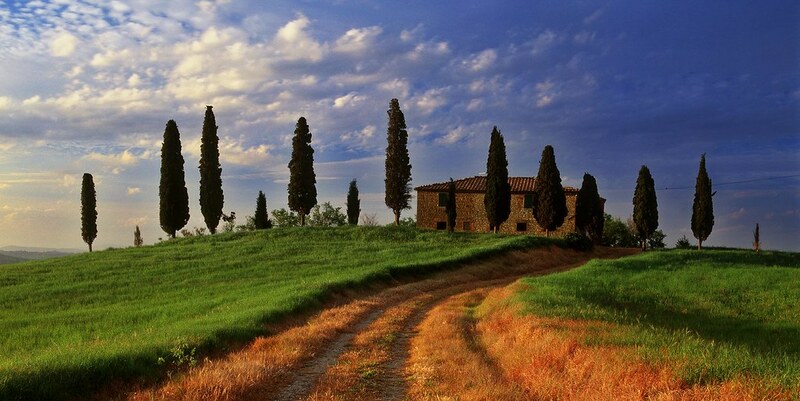 Beautiful Tuscany, the protagonist in many a wine lover’s dreams. Image source: Mark Wassell via flickr. It is in these perfect moments that we raise a toast to the pleasure wine brings. Too soon, though, the pleasure fades, we finish the bottle (or two), and we go back to our everyday existences. If we’ve overdone things, that pleasure may turn to annoyance or even shame at our own gluttony and lack of self-control. So what are we to make of the apparently transient, fickle pleasure associated with food and wine? Could it be a lesser pleasure than that associated with so-called intellectual pursuits like listening to classical music, studying a work of art, or reading a great novel? In this post I want to wrestle with the notion that there is some guilt in enjoying eating, drinking and making merry with a quick romp through the thoughts of some of the world’s greatest philosophers and thinkers. Dig out your thinking caps, wine lovers, and hold on tight. Oh, and pour yourself a nice big glass of something. It’ll help you think. I promise. First off, the English Utilitarian philosopher and political economist John Stuart Mill deserves a good rap across the knuckles for guilt-tripping wine and food lovers. Mill was of the opinion that “some kinds of pleasure are more desirable and more valuable than others” (Utilitarianism: chapter II, paragraph 5). Mill draws a distinction between the different pleasures available to humans based on their supposed quality; physical pleasures like enjoying good food or wine rank lower than intellectual pleasures like playing chess. Interestingly, science has now proven that Mill was partly correct in that physical pleasures are actually processed in a different part of the brain to more abstract pleasures like financial gain (1). So there is a difference between these two types of pleasures. Before you’re shamed into putting down the wine glass, this is only part of the story. Mill claimed that intellectual pleasures are superior since people “would not resign [the capacity for this pleasure] for any quantity of the other pleasure” (Utilitarianism: II.5). In other words, the pleasure derived from a game of chess (for example) is superior to the pleasure from drinking fine wine since people wouldn’t turn down this intellectual pleasure even when faced with an extremely pleasurable tipple (and no, there is absolutely no innuendo intended there). So really Mill’s theory boils down to personal preference. What would you choose, chess or fine wine? Could I live without chess? Well, yes actually, Mr Mill. I think I’d quite happily relinquish the opportunity to play chess (or any other intellectual activity) if it meant enjoying a great wine instead, and I imagine many of my fellow wine lovers would make the same choice. Sorry Mill, but in this corner the physical pleasures have it. Another major kill-joy for wine lovers and foodies over the past couple of centuries has been the temperance movement which reached its apogee with the ratification of the Eighteenth Amendment to the U.S. Constitution in 1919 and the subsequent 14-year Prohibition period. Crucially, though, in its early years the temperance movement only took issue with the overconsumption of spirits, leaving aside wine and beer. In one of his early sermons John Wesley, the founder of Methodism, told his followers, “We may not sell anything which tends to impair health. Such is eminently all that liquid fire, commonly called drams, or spirituous liquors” (2). The backdrop to his advice was the rampant consumption of poor quality gin throughout the city of London; the terrible social impact of cheap gin inspired William Hogarth’s satirical print, Gin Lane. By 1850, an estimated 11 million gallons of gin was being consumed annually in the city and thousands were dying from associated health problems. Hogarth’s satirical Gin Lane print. It wasn’t long, though, before all alcoholic drinks came under the scrutiny the temperance movement. In stark contrast to monks and Jesuit priests who had strived to produce the best possible wine to please God, a Methodist minister named Thomas Welch discovered how to remove yeast bacteria to produce grape juice which could be used for Communion (3). This vilification of wine had a devastating impact on the American wine industry and spread confusion over whether indulging in alcoholic beverages was acceptable in the eyes of God. Despite the colossal number of positive mentions wine gets in the Bible (like Jesus’ first miracle in the Gospel of John, turning water into premium-quality wine! ), even today many Christians all over the world have doubts over whether it’s ok to consume alcohol. The final thinker I want to mention has consistently had his words taken out of context, this time in defence of enjoying the unbridled pleasures of good food and wine. Epicurus, the ancient Greek philosopher who lived from 341 – 270 BC, is typically regarded a dedicated proponent of hedonism, the idea that pleasure is the only really valuable thing in life. However, his conception of pleasure doesn’t align with our contemporary understanding of the adjective derived from his name, “epicurean”, which refers to an individual who pursues sensorial pleasures. On the contrary, Epicurus reportedly said that, “It is better for you to be free of fear lying upon a pallet, than to have a golden couch and a rich table and be full of trouble.” For Epicurus, pleasure also included being free from stress and not limited by a voracious appetite for physical pleasures. Another of his sayings was, “Not what we have, but what we enjoy, constitutes our abundance.” Contentment with simple pleasures, with those things we truly enjoy regardless of our means, is what brings happiness. Thank you for the post. If you interest, please visit the website article about the Anheuser-Busch, Budweiser Beer advertisement featuring John Wesley. The article can be found at https://www.francisasburytriptych.com/john-wesley-budweiser-beer-ad/. Some of the interesting responses to this article, (I recommend them as well), can be found at https://www.francisasburytriptych.com/response-to-john-wesley-budweiser-ad/. Enjoy both articles.